With this post I inaugurate Citrus Week (blog or not blog, you should know that behind the scenes I now have some difficulties closing the fridge, due to an undefined quantity of navel oranges, kara kara oranges, pomelos (hey, you know pomelos? they're as big as basketballs! ), lemons, sweet lemons, blood oranges, yellow and pink grapefruit, tangerines, and tangelos. And I'm not kidding, which is nothing short of alarming...., but this uh .. well let's call it professional deformation would be subject for another post, and here I prefer to ignore it, even if the space for comments is always available below, in case you want to offer advices and suggestions on so-called infallible therapies, relieving mantras and/or DIY remedies. We were saying, Citrus Week, in order to inflict oneself 7 days full of vitamins and to resign more or less happily to a winter that doesn't want to go away. To make things a little more classy (yes, I mean, I have a reputation to defend...), I went and fished out - I mean, literally - an old friend. Same fishmonger, same frozen octopus, same nightmare. Winter is back even at these latitudes, demanding some justice. Let's surrender this way. For the octopus, first I'd like to tell you that the second time around is much easier: you go to sleep and you almost forget that you left a shapeless creature to thaw in the sink. In the morning, with a little effort, it's even possible to feel the tentacles and check their tenderness while sipping coffee. And with the second cup you even get to chat, with the octopus, just like that, talking about the weather, taking the opportunity to apologize and to feel at peace with yourself. But we're digressing, this is material for another post, or even another blog (how about The Adventures of Superblogger? or The Spaghetti Chronicle? or perhaps The Good, the Bad and the Ugly?)... HELP!! Bring to a boil a large pot of lightly salted water, season it with a bay leaf, the carrot, the onion and a stalk of celery, all cleaned and cut into large pieces, then put in the octopus perfectly thawed (btw, if you find it fresh, go ahead, and then maybe you'll tell me how to clean it while drinking coffee...). When it returns to boil, cover the pot and simmer for about an hour (cooking time varies depending on the size of the octopus; to check if it's ready and sufficiently tender, just lift it from the water and stick a tentacle with a knife, it should give up easily). Turn off the heat and let it cool in the same cooking water. Meanwhile, clean the fennel and cut it into thin slices using a mandolin. Peel the citrus fruits , removing the white membrane, cut them into wedges, and collect the juice in a separate bowl. For the dressing, to the juice of oranges and grapefruits add few tablespoons of olive oil, salt and pepper, and some lemon juice if you'd like. 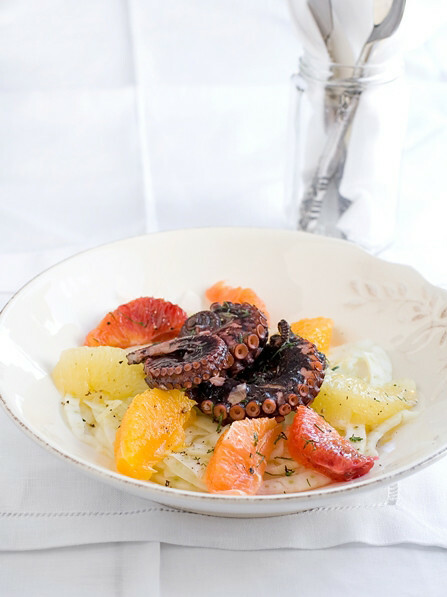 Mix fennel, citrus and octopus, cut into pieces, season with the dressing and sprinkle with a pinch of minced fennel leaves.